“STAR TREK”, said one commentator. 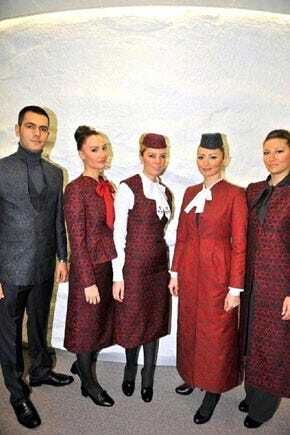 “They may as well wear a burqa,” huffed another.Supposedly chaste new uniforms for Turkish Airlines (THY) cabin attendants have triggered mirth and horror in the cyberworld. They have also sharpened debate about creeping conservatism under the mildly Islamist Justice and Development (AK) government. With its embrace of overt piety and family values, AK is more like America’s religious right than Iran’s mullahs. But secularists feel beleaguered. THY’s ankle-length caftans for women and silver-brocade coats for men seem impractical. Dilek Hanif, who designed them, insisted they were “just several among many other proposed models”. THY backed her claims with photos of more sensible gear. The carrier, which now flies to 219 destinations, was last year voted “Best Airline Europe” by Skytrax, an airline quality-ranking programme, for a second time. Fresh controversy erupted when it emerged that THY has scrapped booze on all domestic flights save six (including Ankara and Istanbul). Eight foreign destinations in Africa and the Middle East have also gone dry. “We are globally sober,” tweeted Bulent Mumay, a journalist for Hurriyet, in a dig at THY’s advertisement, “Globally Yours”. The airline justifies its move on the ground that there is insufficient demand by Anatolian and other Muslim passengers. More likely, some say, it wants to please Turkey’s prime minister, Recep Tayyip Erdogan, a militant teetotaller, who while mayor of Istanbul led a campaign to scrap drink in municipally run restaurants. Yet like the similarly pious president, Abdullah Gul, Mr Erdogan tolerates drinking on his official jet. Even so, many Turks pander to his piety. At a fashion fair in December organisers removed naked mannequins before his arrival. Producers of “The Magnificent Century”, a popular mini-series about Suleiman the Magnificent, shrank his beloved wife Roxelana’s cleavage after Mr Erdogan complained that “our Ottoman forebears are being misrepresented”. After 10 years of AK rule Turkey is richer, more powerful–and less fun.